One of the benefits of summer is many of us are able to set aside routines. We are able to do new things, different things, or the same things at different times. It's refreshing and energizing to be able to do that. However, there are some routines that should not be set-aside, and typically, those are the first to go! I'm talking about spiritual routines. The spiritual disciplines of Bible reading, prayer and church attendance are, unfortunately, among the routines that are set-aside during the summer. Well, it's September and summer is over! It's time to get back into some routines. Do you have a Bible reading plan? If not, there are several available at Bible Gateway. Joining a DLife group will also provide a Bible reading plan. A Bible reading routine is important! Do you have a prayer time? David did. His routine was morning prayer. Daniel prayed three times a day, even under the threat of death! If you haven't already, set a prayer time and keep it! A prayer time routine is important. Jesus had a worship attendance routine. Luke 4:16 - "And he came to Nazareth, where he had been brought up: and, as his custom was, he went into the synagogue on the sabbath day, and stood up for to read." If your church attendance routine was disrupted for summer, it's time to get it back! Now there's a flip-side to this discussion on routines. 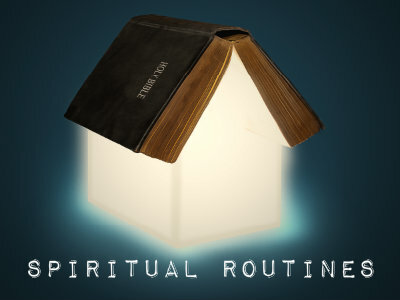 The Bible also warns us about getting into a spiritual rut! Don't let your routines become so ritualistic and lifeless that they become ruts! Amen? We have returned to our normal schedule. All our ministries are meeting again and some now opportunities are coming. Be sure to check the announcements, Facebook page and church website for more information. Here's a teaser... Financial Peace University!